Since we defected to the suburbs, started going to bed at 9.30 and became generally boring and matronly, one aspect of the luxury of space afforded by our new location that we have enjoyed particularly is having two fridge-freezers. The second appliance has not only allowed us to give free-reign to our kleptomaniacal tendencies — with leftovers and other scraps of barely edible, semi-discarded flotsam now littering our principal fridge like turds on a cat hoarder’s parlor floor — it has also meant that our collection of frozen comestibles keeps growing and growing. A pessimist might look at both these developments as disadvantageous. And indeed, periodic clean-outs of the colorful, hairy and pungent corners of our refrigerator are rather unpleasant affairs for which the availability of gelid gourmet items mostly compensates. Recently, having sorted freezer contents by date range, we noticed a scant pound of Québecois duck livers that needed our attention. Bought at a wonderful emporium of all things ducky and fatty in Montreal in the summer of 2013, but originating in the countrified environs of Lac Brôme in the Eastern Townships, these were the small but perfectly-formed livers of wild fowl fed exclusively on pond weed and grubs rather than the creamy, grain-fed foie of fattened domestic birds. Our visit to Lac Brôme was the culmination of a magnificent day-trip out of Montreal, taking in small cheese-makers, cider mills, and wineries. 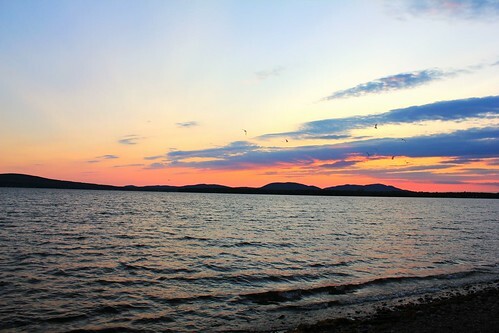 Strolling around the lake with the sun dipping behind the western hills, we watched a floating log being gently buffeted by water lapping the shore, and were deafened by the thunderous clapping of electric-green wings as hundreds of Lac Brôme ducks suddenly took to the air as one. That evening, as the romantics who had elected to watch the sunset from the restaurant’s rear deck were being eaten alive by midges, we endured service like molasses at Le Relais Restaurant Bistro/L’Auberge Knowlton, but eventually enjoyed the pan-fried livers of some of those ducks’ less fortunate relatives bathed in a wholegrain mustard sauce. Driving back into Montreal that evening through the gloaming and eventual dusk, our gourmet-in-training son piped up from the back seat asking when we could have duck again. After a gut-busting trip like that, in which we didn’t hold ourselves back for a moment, we gave ourselves a fair amount of respite, tackling duck only once in the interim. Our lives being what they are, and Paolo now having a baby sister, we didn’t get around to the Lac Brôme livers we brought back with us until she was almost a year old. 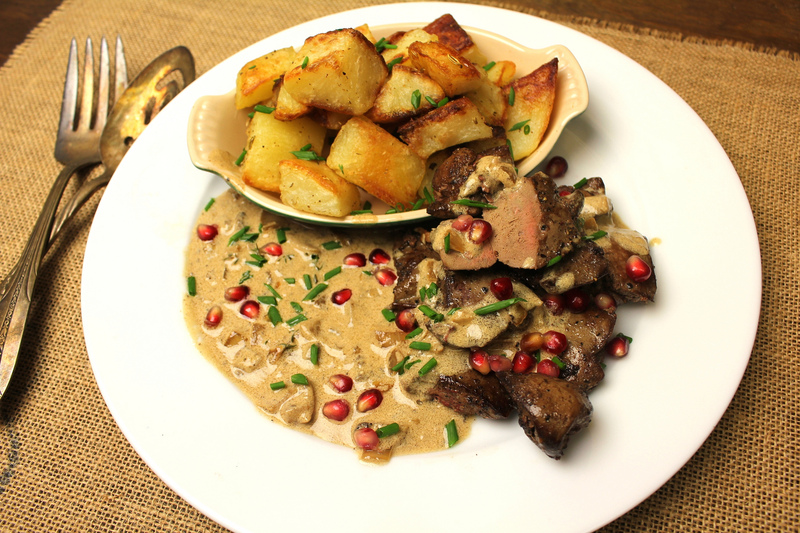 And again, our lives being what they are, we were unable to raise much more inspiration than pan-frying them lightly to keep the centers pink and bathing them in a brandy-cream sauce scattered jauntily with tart, ruby pomegranate seeds. Cut duck livers into 2-3 inch/5-8cm pieces, and season well with salt and black pepper. In a medium saucepan over medium heat, melt half the butter and add duck livers. Cook two minutes one side, turn carefully, and cook for another two on the other. Remove to a plate. Do not place plate in oven or livers will overcook! Add remaining butter to pan, and once melted add minced garlic. Cook until fragrant, about 1.5 minutes, before turning heat up to high. Add brandy, and standing/leaning well back, tilt pan towards flame. Brandy should ignite quickly, and die down shortly after. When brandy is reduced by half, add cream, and stir to combine. Taste sauce and correct seasoning with salt and pepper. 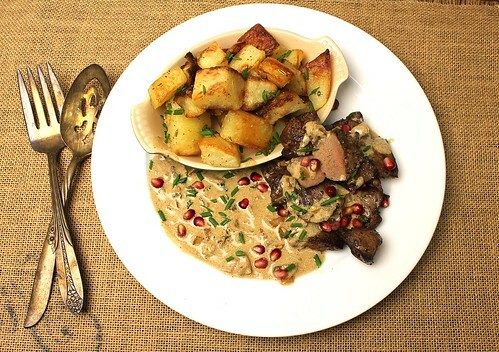 Plate cooled livers, top generously with warm sauce, and sprinkle with pomegranate seeds. We served ours with fried potatoes and a green salad, but mashed potatoes or polenta would be good starch subs.